In the year 95, Saint John the Evangelist, the only surviving Apostle, who was governing all the churches of Asia Minor (present-day Turkey), was apprehended at Ephesus and sent in chains to Rome. 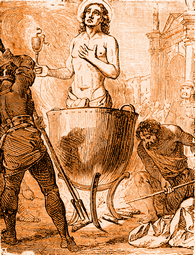 The Emperor Domitian did not relent at the sight of the venerable old man, but condemned him to be cast into a cauldron of boiling oil. The martyr doubtless heard, with great joy, this barbarous sentence; the most cruel torments seemed to him light and agreeable because he hoped they would unite him forever to his divine Master and Saviour. But God accepted his will and crowned his desire; He conferred on him the honor and merit of martyrdom while suspending the operation of the fire, just as He had formerly preserved the three children from injury in the Babylonian furnace. The seething oil was changed for him into an invigorating bath, and the Saint came out more refreshed than when he had entered the cauldron. The glorious triumph of Saint John happened just beyond the gate of Rome called the Latina. A church which ever since has borne this title was consecrated there, in memory of the miracle. Domitian saw this miracle without deriving the least advantage from it, remaining hardened in his iniquity. Nonetheless, he contented himself afterwards with banishing the holy Apostle to the little island of Patmos. Saint John returned to Ephesus during the mild reign of Nerva (96-98), who during his short imperial government lasting one year and four months, merely labored to restore the faded luster of the Roman Empire. He who seeks the glory of the One who sent him is truthful, and there is no injustice in him.